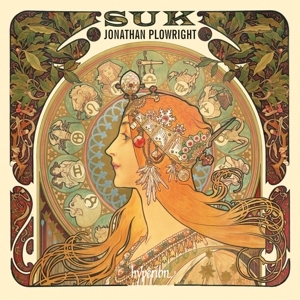 Hailed by reviewers as "a colossal musical mind" with a "transcendent technique", Jonathan Plowright is "one of the finest living pianists" according to Gramophone Magazine. Gold Medallist at the Royal Academy of Music and a Fulbright Scholar, prizewinner in many competitions, Jonathan also won the Gold Medal at the Royal Overseas League Competition as well as first prize at the European Piano Competition. Critics, colleagues and audiences alike have since had unanimous praise for his many national and international performances and he has been in demand all over the world as recitalist, appeared with leading orchestras and ensembles and given numerous radio broadcasts. He has a hugely successful string of recordings on the Hyperion and BIS labels all of which have been enthusiastically received with outstanding reviews in the worldwide media. With thirteen critically acclaimed CDs, Jonathan is now well established on Hyperion Records distinguished roster of pianists. In February 2016 his 4th CD for the Romantic Piano Concerto Series was released, featuring Concertos by Ludomir Rozycki. As well as receiving an ICMA nomination, it went straight to Number 6 in the Classical Charts. His 2010 commemorative 'Hommage a Chopin' recording also reached the Top Twenty Classical Chart and attracted many accolades, including the prestigious Preis der Deutschen Schallplattenkritik, Gramophone Editor’s Choice, Diapason D'Or and CD of the Week on both ClassicFM and ABC ClassicFM. Likewise, his follow-up 'Homage to Paderewski' disc was Daily Telegraph Classical CD of the Week. His recording of the Constant Lambert Piano Concerto (which he world premiered in 1988) with David Lloyd Jones and the English Northern Philharmonia was Gramophone Editor’s Choice and CD of the Week in both The Sunday Times and ClassicFM. His first chamber music disc for the label was released in December 2012 featuring the Szymanowski Quartet in works by Polish Romantic composers, Zarebski and Zelenski, and was BBC Music Magazine Chamber Choice. In October 2015 Jonathan and the Quartet recorded a follow up CD of Polish Piano Quintets by Friedman and Rozycki which was released in September 2016. 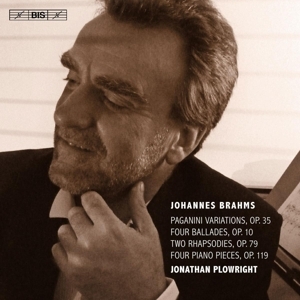 Jonathan is also recording the complete Brahms solo piano works for the Swedish label, BIS Records, the first three volumes of which were released to tremendous critical acclaim, receiving many 5 Star Reviews in numerous publications, an 'Outstanding' Award from International Record Review, also Gramophone, BBC Music Magazine and ABC Limelight Magazine Editor’s Choice. His interpretations are being compared to the likes of Lupu, Katchen, Arrau and Pires, and have been described as "a stunning achievement". The third volume was shortlisted for the 2016 Gramophone Awards. His fourth is due out in 2017. Jonathan has enjoyed performing in some of the finest concert halls around the world, from Sydney Opera House to the Royal Albert Hall, in the luxurious surroundings of stately homes, castles and cruise ships, as well as in some rather more unusual venues - including the barrel room of a winery in California and a wild elephant game reserve in South Africa! Also highly respected as a chamber musician, Jonathan regularly collaborates with other musicians, appearing at chamber festivals around the world. Amongst those he has performed with are fellow pianists Piers Lane, Artur Pizarro, Frederick Chiu, Leslie Howard and Kathy Stott, instrumentalists such as Raphael Wallfisch, Leonid Gorokov, the Brodsky Quartet, the Coull Quartet, the Szymanowski Quartet, the Scottish Ensemble amongst many others. He has appeared as concerto soloist with major orchestras, including the London Philharmonic, BBC Scottish Symphony, the Hallé, the Royal Philharmonic, BBC Concert, English Chamber, the Odessa Philharmonic, the Warsaw Philharmonic, the Polish Radio and Polish National, although most memorable was a performance of Gershwin's Rhapsody in Blue with the combined forces of the United States Air Force and Red Army Bands! He has worked with notable conductors such as Martyn Brabbins, Paul Daniel, Sir Neville Marriner, Gérard Korsten, Christoph Koenig, Barry Wordsworth, Lukasz Borowicz and Michal Dworzynski. Jonathan has become a well known and highly respected advocate of neglected Polish Romantic piano repertoire ever since his first recording of a rare collection of pieces by Paderewski earned him an invitation to give the closing recital of the Polish Parliament’s 2001 ‘Year of Paderewski’ celebrations in Warsaw. Since then, Jonathan's recordings featuring the music of the largely forgotten Polish/US emigré Sigismund Stojowski led to a revival of interest in his music after several generations of neglect and attracted considerable attention in the international music press. The discs were both named 'Record of the Month' in the Polish national music monthly Muzyka 21 and Jonathan has since been invited to perform with the Warsaw Philharmonic Orchestra, the Polish Radio Symphony Orchestra, the Polish National Symphony Orchestra and other leading Polish orchestras. In 2006 he gave a sell-out Weill Hall recital promoted by the Kosciuszko Foundation in New York. Whilst in the USA he was also invited to perform at a special event at the Polish Music Centre at the University of Southern California, in the presence of Stojowski's surviving family, on the occasion of the 60th anniversary of his death and in celebration of their donation of the Stojowski manuscripts and personal papers to the University. His hugely successful Hyperion recording of the notoriously difficult Paderewski Sonata in 2007 was admired by many, including the BBC who declared: "The playing is world-class; understated virtuosity at its best." To commemorate the 150th anniversary of the birth of Paderewski in November 2010, Jonathan was invited back by the Polish Music Centre in Los Angeles for a series of recitals in the USA, including the Paderewski Festival, which Jonathan was instrumental in re-launching as an annual event in Paso Robles, a spa town with an historic association with the famous composer, pianist and statesman. To celebrate the 200th anniversary of the birth of Chopin in 2010, as well as recitals throughout Poland, Jonathan was also invited to appear with the Warsaw Philharmonic Orchestra during their special Year of Chopin celebrations. Jonathan is on the Keyboard Faculty of the Royal Conservatoire of Scotland, and is often invited to give masterclasses, consultation lessons and prize adjudications at competitions and international conservatoires. In 2013 he was made a Fellow of the Royal Academy of Music.